From Wednesday 26 December 2018 until Sunday 26 December 2038: Enjoy 10 % off! From Wednesday 26 December 2018 until Sunday 26 December 2038: Enjoy 15 % off! From Thursday 14 March 2019 until Monday 14 March 2039: Enjoy 5 % off! 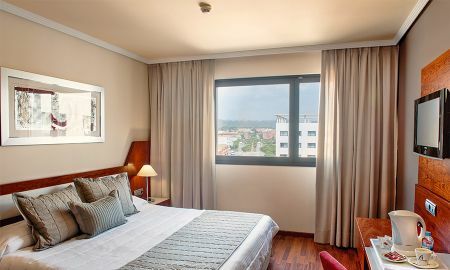 Strategically located in the business area of Sant Boi de Llobregat, Front Air Congress is a modern and elegant hotel, where you can stay or hold a business meeting or celebration with the comfort of being on the outskirts of Barcelona. 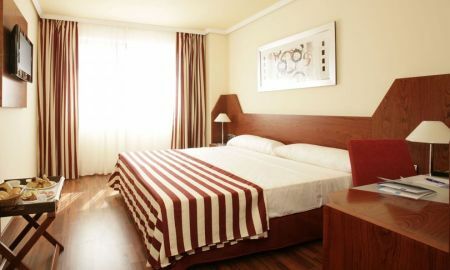 With modern quality facilities designed to make your stay unique, the hotel offers 229 exterior rooms equipped with all kinds of details, LCD TV and WIFI included. At the same time, you can enjoy 2000m² of meeting rooms, most with natural light, perfect for meetings and celebrations, as well as a terrace of over 1.200m². And for your relaxation, Front Air Congress has created Natural space, a spa with more than 1,200m², with gym, massages and therapeutic treatments. Front Air Congress hotel is only 5km from El Prat Barcelona airport, 15km from the cultural attractions and sports offered by the city, such as La Sagrada Familia, Las Ramblas, Plaza Catalunya, Passeig de Gràcia, La Catedral, Camp Nou and the Olympic Area, 7km from the beach and 3km from the Stadium Cornella-El Prat.